A few hours ago, several of you expressed interest in knowing how our cats are doing. -Ariadne has decided that the bathrobe that I got for Christmas is her mother. She spends a lot of time attempting to nurse on it. These attempts tend to be unsuccessful, leaving her puzzled, but not enough that she'll stop doing it. 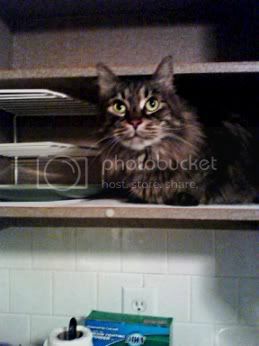 -Basil has decided that he should live in our dish cupboards. The ones above the counters. This is unfortunate insofar as he gets up there and then he has no idea how to get down again when he wants to eat or something. So yesterday he pawed and noodged and squirmed his way around until he pulled the shelf paper entirely off the shelf, sending every single dish in the cabinet crashing to the counter and/or the floor. He still didn't know how to get down. -Ariadne, on the other hand, would like to live in the dishwasher. It's harder to get into because she can't unlatch it, but if we ever happen to leave it open a crack she nudges it open and jumps right in. 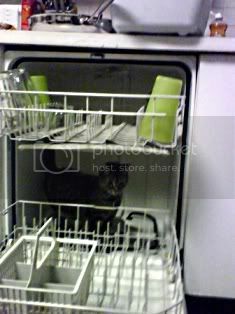 It's hard to wash cat hair off your dishes when there is a cat making its home in your dishwasher. -Both Basil and Ariadne think our fake Christmas tree is the most delectable treat in the world. They seem not to have made the connection between this delectable treat and the fact that they throw up pieces of plastic of exactly the same size, shape, color, and consistency as what they just ate five minutes later. -Their constant attempts to eat the tree lead to lots of fun games with a little hair spritzer filled with water. I think we should get a Super Soaker or something. -Sometime after Christmas Basil decided that he would not drink his standing water anymore (he's always had a rough relationship with standing water, but he's basically just gone off it), and Ariadne docilely followed his example. So we started turning on the bathtub faucet whenever they jump in the bathtub and look at us expectantly. Except now they've stopped drinking that. New water source: the toilet. How is that different from standing water? 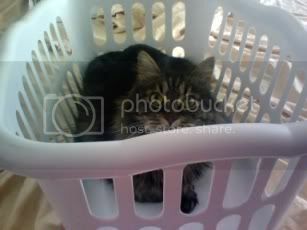 -Basil suffers periodic delusions in which he believes he is a load of laundry. -Ariadne suffers periodic delusions in which she believes that if she sticks just her head under the bed, no one can see her. -In summary, Basil and Ariadne are having a fine old time in this post-holiday season. -Or, as λ says: in summary, Basil and Ariadne are cats. This is the hour eighteen post of my blogathon for my aunt Tricia, who is dying of end-stage ovarian cancer and whose family is being hit with a whole lot of bills that they can't afford alone as a result. Donations can be made at the link given above. A number of topics are still unclaimed and can be bought for $5 or more.